From the new Cambria console collection in “Bear Claw Grey”. – Sun Country 737-800 in First. 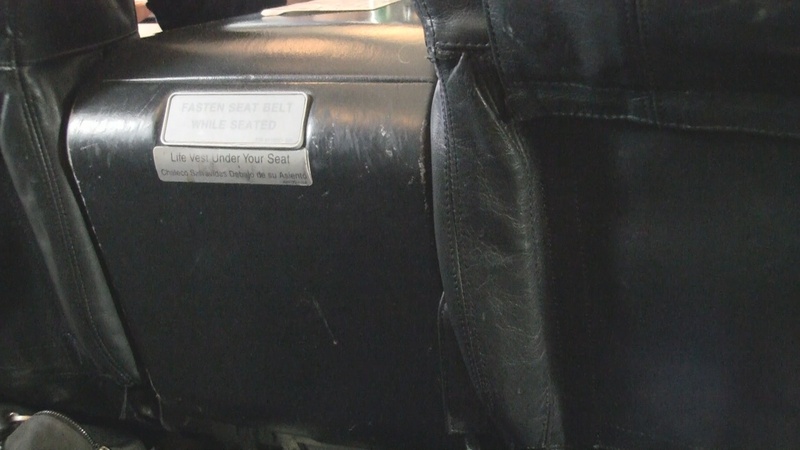 The Seat: You won’t likely complain that first class seats aboard this Sun Country Airlines 737-800 are missing that “broken-in” feel. These well-traveled leather monsters are big and comfy but show their age in wear. We’ve been (and still are) big fans of Sun Country Airlines, but you’d think at some point an airline owned by Cambria, a company that stakes it’s business on home-improvement, might want to spruce up their airplane cabins. We’re still looking for new granite counter-tops in the galley (and maybe some touch up paint in the rest of the cabin). No matter how it looks, the seat is a comfortable one. According to SeatGuru, Sun Country’s 39 inches of seat pitch in first lands in between what you’ll find aboard the 737-800’s of Delta (38″) and American (40″ to 42″) with average domestic first class width. 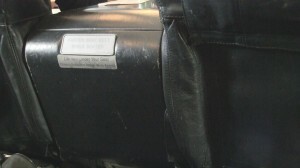 All seats in this cabin have good recline, adjustable headrests and a generous center console. On some flights you might see that there’s no closet on the A/C side in first class. When that’s the case, you’ll get a lot more legroom on that side of row 1, otherwise you’ll be better off in row 2 or here in row 3 for stretching out. Service: Nothing extraordinary came our way in regards to service on this flight. It was the expected high-level Minnesota friendliness we’ve come to expect from Sun Country. It helps if you speak the language, ya’ know. Food: It feels like you’re in one of those “how flying used to be” daydreams that flight critics have been big on lately . A big helping of beef brisket next to a healthy scoop of mashed potatoes and corn. Sure there’s no in-flight chef shaving off thick slices of galley-cooked ham, but still a nice departure from the chicken or pasta choices we’re used to. 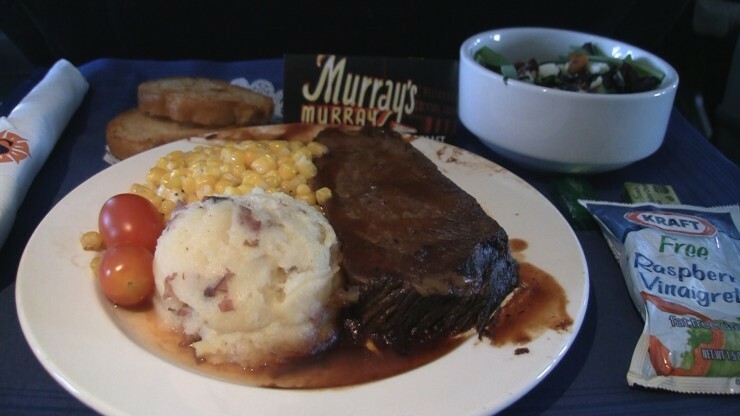 With this meal you also get a couple of small pieces of garlic toast, a long-time favorite starter at locally famous Murray’s Steak House in Minneapolis. Connectivity/Wi-fi/Entertainment: Charged tablets, laptops and phones are a must-have if you want to do work, watch your own videos or play your own stash of dig-dug style 80’s arcade games. 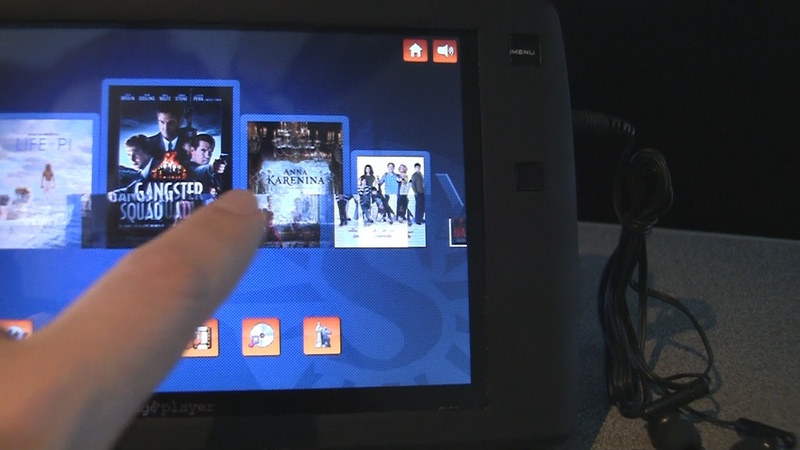 But now, Sun Country’s got fully-charged Digi-e players loaded with movies, TV and specialty programs. Nice to see that the airline has added something to do aboard their always power and web-free flights. Notes: As noted in earlier reviews, Sun Country has been a good choice for vacation travelers in the Twin Cities (Minneapolis/St. Paul) for a long time. With the airline continuing to expand it’s year round service to domestic spots in the US, I see them as a great alternative with affordable options for upgrades and increasingly good on-board options in both classes. Summary: 3C is a typical first class seat aboard this aircraft and an okay option if you’re flying a configuration with a bulkhead wall in front of row 1 on the A/C side. It’s got slightly better than average legroom, good width and is served-up with good food and friendly service. Just keep 1A or 1C in mind if the bulkhead wall is missing and you appreciate a lot more legroom. Rating: 3 hops (of 5). Strategy: Sun Country allows for you to upgrade (space available) to first during check-in, at the gate or even on-board. Prices vary, but are very competitive compared to upgrade prices aboard other carriers. How I got it: Available upgrades are typically available online at check-in but weren’t available until I got to the airport. In fact, it wasn’t offered by the kiosk, either. Asking the pre-security check-in agent worked though. Looks like I got the last one. Book at Sun Country’s website.